This is a tutorial about getting your website setup to use TLS. TLS is important, and if you’re here you probably already know why. But here’s a wiki page about it just in case.Before we start setting things up, let’s first talk about scope. This article isn’t trying to answer every single aspect of setting up a server with NGINX and Let’s Encrypt. But it is trying to combine advice from a series of other guides in order to give you a complete and somewhat more up-to-date guide on how to use these technologies.You won’t need to understand how all the pieces work to still get things working. And at the end, you’ll have a website that is secured with TLS. Certbot itself has really good installation docs. Just use the two provided drop down menus to find your software and system. For a complete example, I’m using NGINX on Debian Jesse, which links to these instructions. Then run apt-get update (sudo may be required). Finally, install Certbot by running apt-get install certbot -t jessie-backports(again sudo may be required). You should now have a certbot command. 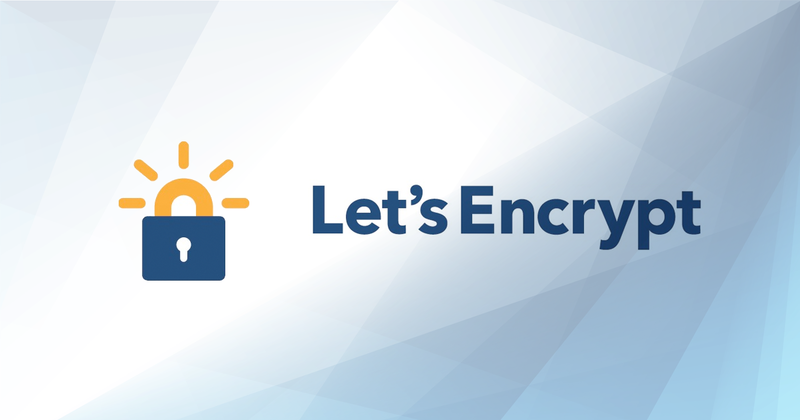 The next couple of steps come from NGINX’s own wonderful docs on using Let’s Encrypt, as well as Certbot’s config docs. You want to save this somewhere where you can find it again. Either make a letsencrypt folder in your home directory, or make a configs folder in /etc/letsencrypt/. I personally saved the config above here:/etc/letsencrypt/configs/quine.space.conf. Now lemme say some stuff about the contents of this file. The domains = ... section is a comma separated list of the domains you want your certificate to cover. Subdomains like http://www.example.com are different than just example.com, so you need to list them all. The rsa-key-size = ... is the length of the RSA key for your certificate. For now, you probably want the default of 2048, because it’s still considered secure, and it’s faster than larger keys. Additionally, key size doesn’t linearly add security, so a key of 4096 bits is only 16% more secure than a key of 2048 bits. Besides, not everything works with 4096 bit keys, and they’re slower. The email = ... doesn’t have anything to do with your key, but it will allow Let’s Encrypt to email you when your certificate is expiring, if it hasn’t been renewed yet. text = True turns off the UI that Certbot has. This only has an effect when creating the certificate initially, so setting it is optional. The authenticator = ... and webroot-path = ... are the method of authentication used to prove that you have the domain. The available methods are listedhere. We’re going to use webroot because it can be used with any type of web server, and doesn’t require either port 80 or 443 to be free. I didn’t use the --nginx plugin because I couldn’t get it to work initially, and “needed” to update my certificate quickly, as the previous one had expired. Another key point about webroot-path is that this is the location that NGINX will use to serve a file that it will use to authenticate our certificate. So the www-data user will need access to this folder to serve the information. In order to authenticate our certificate, we need to modify the NGINX config to allow Let’s Encrypt to access a temporary file. This’ll involve an update to whatever NGINX configuration you have now. For quine.space, I use NGINX only for the TLS termination, and proxy the traffic locally. So here’s a sample configuration with some explanation, but your config will vary from what’s shown here. # The part we care about starts with "server"
# Maybe a rewrite to move people to https? The key to this file is the initial Let’s Encrypt setup. You may remember /var/www/letsencrypt. It was in our original Certbot config, and it’s the location from which Certbot will check that we control this domain. An aside: We currently have the check here, on port 80 and unencrypted, because we don’t yet have a certificate. Later, we can actually put this configuration in our TLS config (port 443), and use our current certificate to secure the connection in checking for our new one. After you’ve setup NGINX, test the config with nginx -t and reload it with nginx -s reload. As always, you might need sudo for those. Now that we have everything setup, we can do a test run of Certbot to make sure it works before we actually run it to get our certificates! making sure to put the path to your config after the --config flag. If your dry run is successful, go ahead and run the same command without the --dry-run. If that works, you should see a message under IMPORTANT NOTES: that tells you where your certificate was saved. We’ll need that in a second. Now that we have our certificates, we can setup NGINX to use them! You probably want to change your server config for port 80 to no longer include serving the challenge response, and to now forward traffic to port 443. Then add the ssl certificates to your 443 section, as well as the challenge response url that used to be under the port 80 section. where the ssl_certificate and ssl_certificate_key lines point to the location you saw above under IMPORTANT NOTES:. If you don’t remember where that was, don’t worry too much. It’s probably in /etc/letsencrypt/live//. Don’t forget to reload the nginx configuration after you’ve changed your config. nginx -t and nginx -s reload. After all of that, test to make sure you can use the new configuration to renew your certificates. Do this by running certbot renew --dry-run. If you eventually see part of a message say Congratulations, all renewals succeeded., then you’re good to go. Now that everything is setup properly, we need to automate the renewal process. For Debian Jesse, this is super easy, as Certbot has already setup a cron for us in /etc/cron.d/certbot. If you look at that file, you’ll see it already has a cron command setup to run twice a day. We just need one little tweak to make things work for us. That is, adding a --post-hook to the certbot renew command so that our server reloads once we have the new certificates in place. So add this to the end of the line after certbot renew: --post-hook "service nginx reload". Oh, and why run this command twice a day, when we only need to renew the certificate once every three months? Well, Let’s Encrypt actually suggests this. Their API rate limit applies to the actual certificate generation, not to attempts to renew it. And the renewal only generates the new certificate if the current certificate will expire in 30 days. You could modify this timing if you want, but it’s no problem to leave it as it is. 0 */12 * * * root test -x /usr/bin/certbot -a \! -d /run/systemd/system && perl -e 'sleep int(rand(3600))' && certbot renew --post-hook "service nginx reload"
Also make sure you have perl installed. But if you don’t, you can just remove the perl section: && perl -e 'sleep int(rand(3600))'. Once you’ve got this all setup, you’ll want to make sure your certificate is renewing properly. Mark your calendar for 2 months and a couple days out from when you first did this. Then check your certificate in the web browser. It should have a new “Begins On” date.